Yesterday I picked up my share of vegetables from my CSA, Frog Bottom Farm. 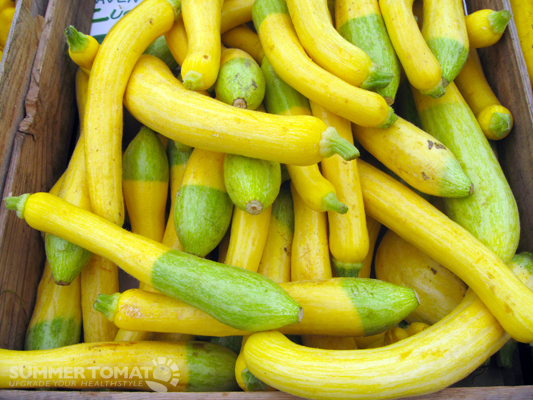 In it was two pounds of mixed summer squash (I picked zucchini, barq squash, and beautiful, bi-colored zephyr squash), four beets (with tops still attached), five really long spring onions, a cucumber, a bag of arugula, and a bag of basil leaves. I decided to use some of the squash, green onions, and basil in a baked egg dish that turned out really well. I had some of the leftovers this morning for breakfast, and I can confirm that baked egg type dishes do, in fact, reheat nicely! It’s sort of like an eggy lasagna. Preheat the oven to 375 degrees. Heat 1 Tbsp. of the olive oil in a pan over medium heat. 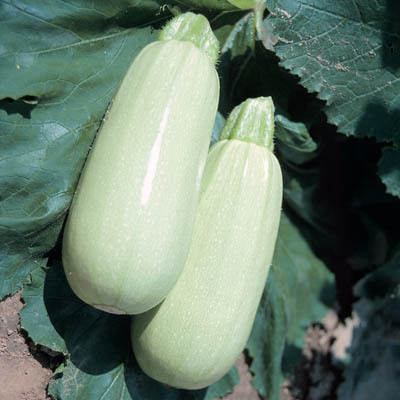 When the oil is hot, add the zucchini and saute until the zucchini is cooked through and lightly brown around the edges. Use the remaining 1 Tbsp. of oil to grease a 9 x 13 inch baking pan. Beat the eggs in a bowl. Add salt, pepper, the green onions, the basil, and half of the parmesan cheese. Arrange the slices of bread in the pan so that the bottom of the pan is covered by a layer of bread. 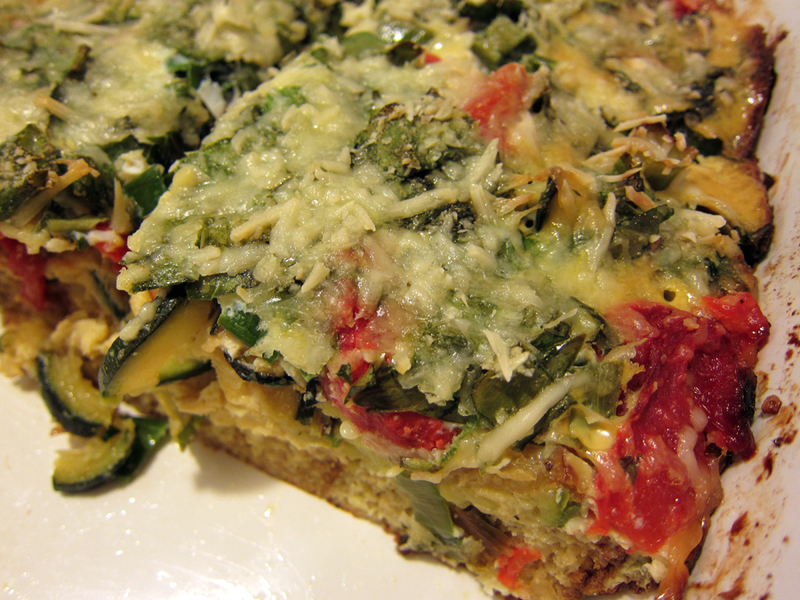 When the zucchini is cooked, layer the zucchini and roasted red bell peppers on top of the bread. 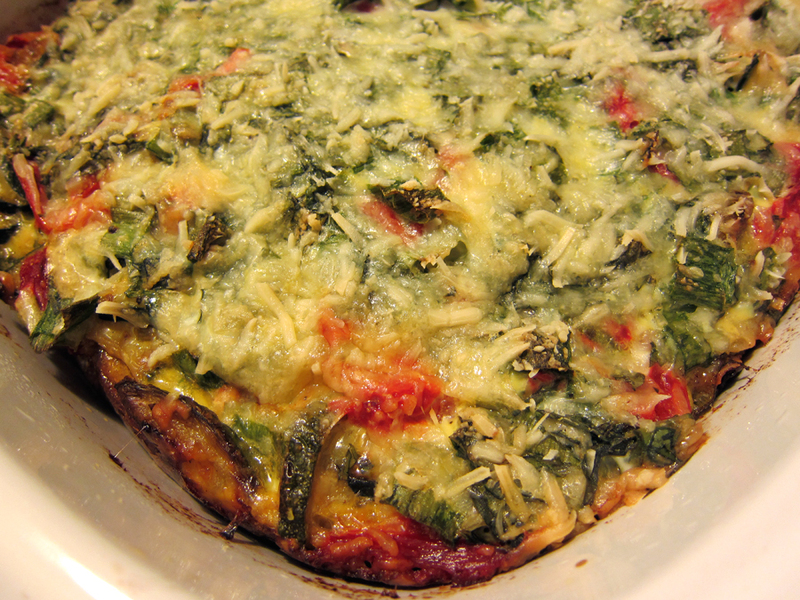 Pour the egg-basil-onion-parmesan mixture over everything, allowing the egg to soak down through the bottom layers. Sprinkle the rest of the parmesan cheese on top. Bake at 375 degrees until the eggs are set and the cheese is melted. For me, this took around 25 minutes. Let the dish cool slightly, then slice into squares and serve hot. When it looks like this, it's done! This dish would also be delicious with caramelized onions, but I was fresh out of those. A nice side dish would be a green salad. We ate ours and then gorged ourselves on local strawberries and blueberries that we bought at the farmers’ market where we go to pick up our weekly CSA veggies, which is held every Saturday at St. Stephen’s Episcopal Church in Richmond, Virginia. If you can bring yourself to get up early on a Saturday, I heartily recommend the St. Stephen’s Farmers’ Market! This meal was delicious! It consisted of vegetarian sloppy joes, using beans and veggies instead of meat with a homemade sauce, homemade corn bread, and cooked greens (leftover from a takeout barbecue meal). The recipe for the sloppy joe beans was modified from a Rachael Ray recipe for “Sloppy Veg-Head Joes.” I added different veggies, like carrots and celery, a can of red kidney beans, and a couple tablespoons of natural ketchup (no high-fructose corn syrup!) instead of the brown sugar. 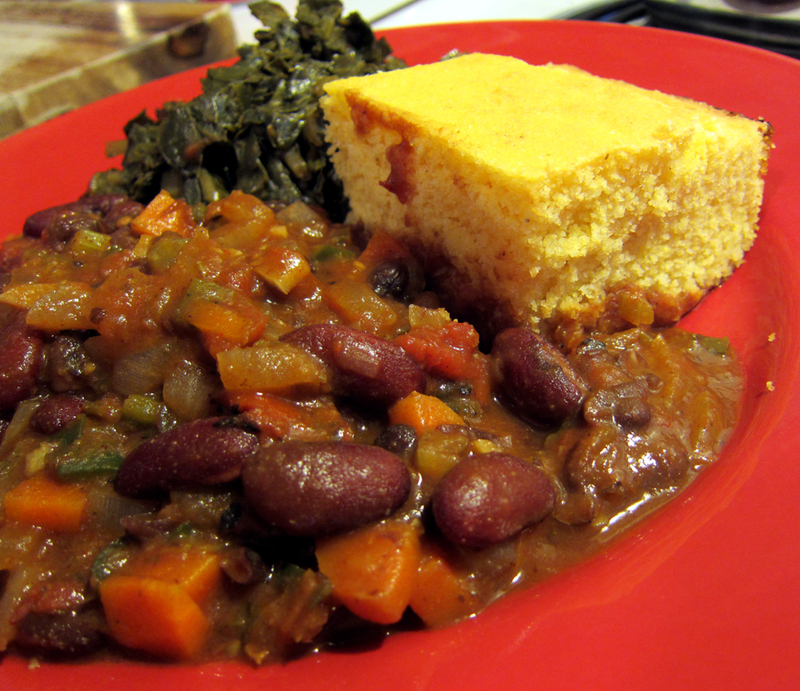 It came out very tasty and went great with the cornbread. The cornbread was a modified version of Mark Bittman’s recipe for cornbread. I used plain lowfat yogurt instead of buttermilk, and instead of sugar, I used three tablespoons of maple syrup to make maple cornbread. I use variations of Bittman’s cornbread all the time. It’s easy, relatively healthy, and most importantly, it’s delicious. 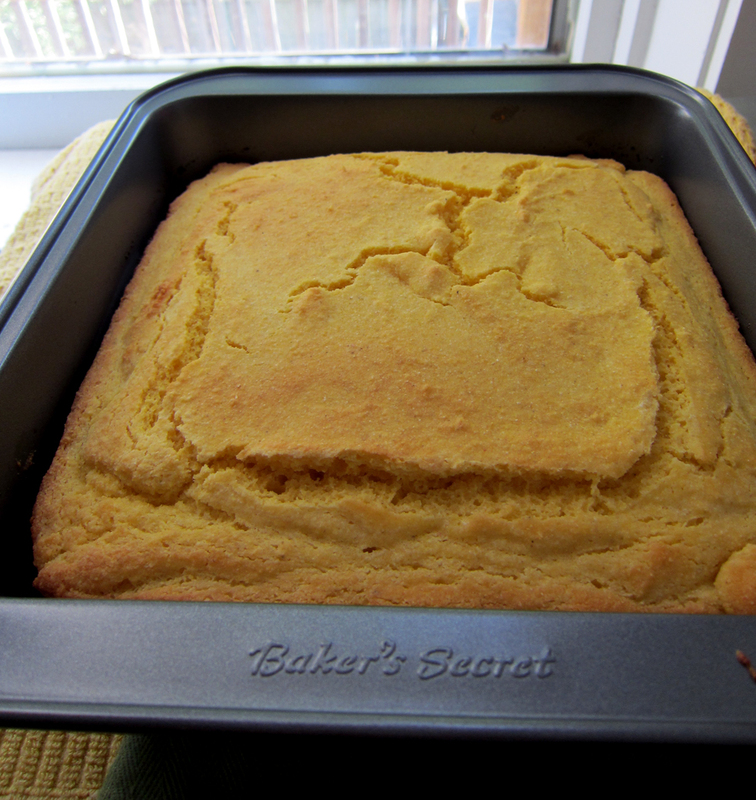 You can find Mark Bittman’s recipe for good old fashioned cornbread here, on his website. I’ve been experimenting with this cornbread recipe ever since I made it the first time. Vegetable additions like sliced green onions, fresh cooked corn kernels, or shredded zucchini all work well. Dinner tonight was chicken and sausage gumbo with brown rice. This version has a ton of vegetables, including onions, celery, bell peppers, tomatoes, okra, and green onions and uses smoked turkey sausage and shredded rotisserie chicken. It is spicy, smoky, and extremely satisfying. Boyfriend helped by picking the store-bought rotisserie chicken off the bone and shredding it and by making me a delicious gin and tonic. We ate the gumbo with a big scoop of hot, cooked brown rice added right on top. The savory, spicy tomato broth soaked into the chewy brown rice and made the dish absolutely delicious. I loved all the different textures and tried to get a little bit of each ingredient in every spoonful. Aaron’s favorite part was (as always) the smoked sausage. Add the onions, bell peppers, and celery to the pot and stir until the vegetables are beginning to soften. Add the sliced sausage and garlic and cook until fragrant. Add the canned tomatoes, water, bay leaves, oregano, creole seasoning, hot sauce (if using), salt, and pepper. Be careful not to add too much salt, as creole seasoning often contains salt. Stir and bring to a boil. Reduce heat to low, simmer for about 10 minutes, allowing the tomatoes and vegetables to break down and the flavors to marry. Add the okra and continue to simmer until the okra is cooked through, about another 10 minutes. 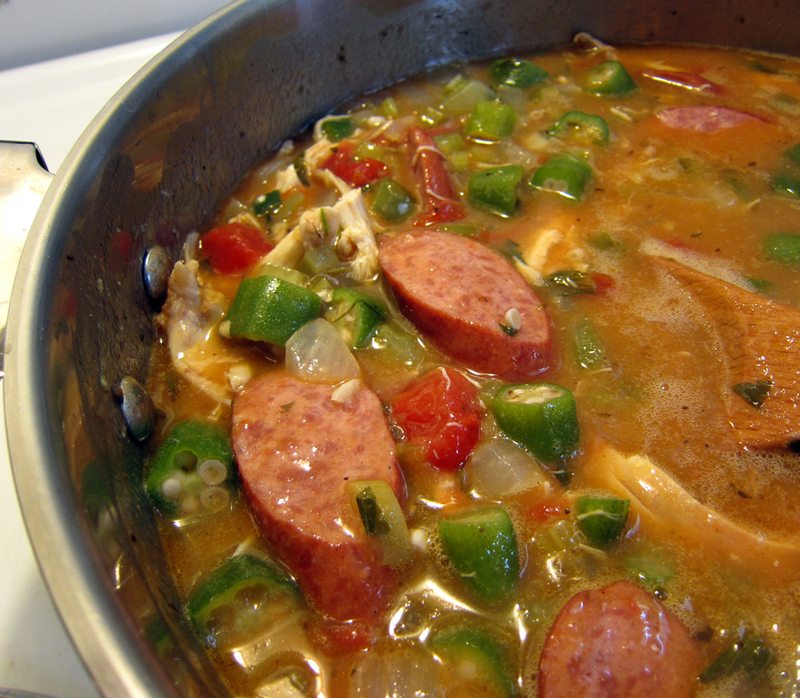 If the gumbo seems too thick, you can add more water. Add the shredded chicken and green onions. Stir to combine. Cook for another 1-2 minutes, until the chicken is heated through. Taste and adjust seasoning. 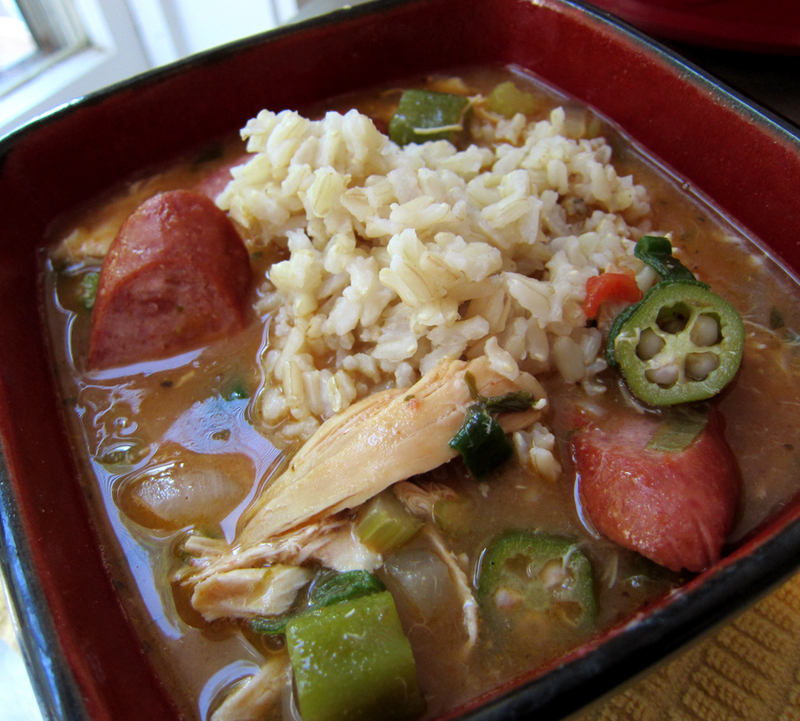 Serve the gumbo hot in bowls with scoops of brown rice and enjoy! It is time for a blog reboot. I have graduated with my Master’s Degree in Library Science (before you ask, yes, that’s a real thing), and I now have time, glorious time! I also have a new camera and quite a lot of new recipes to share with you. So, I am breaking my blogging fast. In honor of that, my first post since 2009 (eegad!) shall be about breakfast. Specifically, my breakfast this morning, when I was tempted to go out to breakfast and spend quite a lot of money for someone else to cook for me, but instead I decided that it is probably better to cook with what I have here, in my pantry and in my fridge. Some of my favorite meals start this way. I haven’t been to the grocery store in a while, but after scrounging around the kitchen I found some eggs, two sweet potatoes, and a vidalia onion. That, and a little oil, butter, salt, pepper, and cajun seasoning was all I needed to make a healthy, tasty, cheap breakfast for Boyfriend and me. Heat the oil in a skillet over medium heat. Add the onions and saute until the onions are beginning to soften. Add the sweet potato cubes to the onions. Sprinkle with salt, pepper, and cajun seasoning. Stir to coat the sweet potatoes with oil. Sautee the hash until the sweet potatoes are cooked through and can be easily pierced with a fork – this took me around 15-20 minutes. 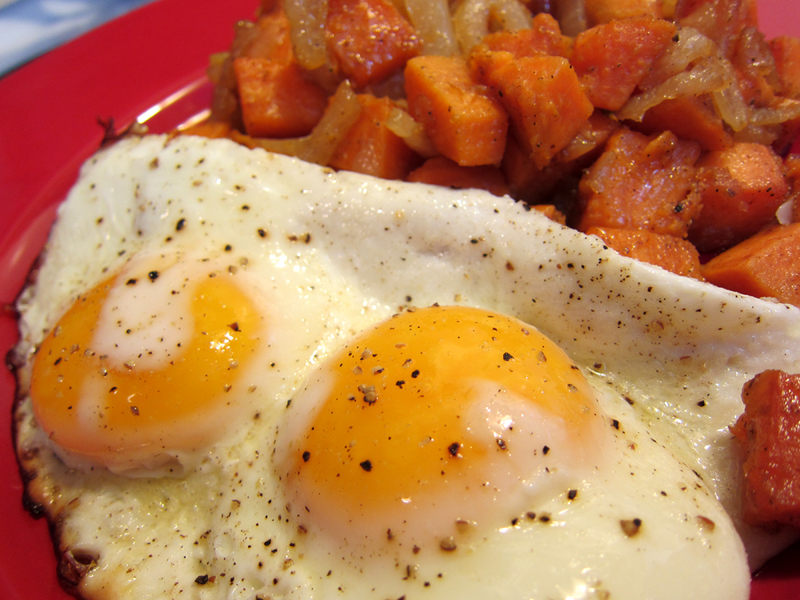 The sweet potato hash is a nice change from home fries or hash browns. It is slightly sweet from the natural sugars in the sweet potato and the onion, and pleasantly spicy from the cajun seasoning. Plus, sweet potatoes can be bought on the cheap (I bought mine at 99 cents per pound) and they are packed with healthy stuff, like beta carotene and fiber. One medium cooked sweet potato contains 438% of the recommended daily intake of Vitamin A, 4 grams of fiber, and has only 105 calories, according to the Nutrition Data website. I am declaring this sweet potato hash healthy, tasty, and cheap (not to mention easy as anything to cook). It consisted of ground turkey breast, tomatoes, kidney beans, black beans, onions, green peppers, chili powder, and smoked paprika. I also added some corn kernels – I don’t know if it’s “proper” to put corn into chili (I know a lot of people have strong opinions about whether it’s okay to add beans, too!) but I like the taste and color. When Aaron and I ate our bowls of chili, we added 2% shredded cheddar cheese and some (okay, lots of) reduced-fat sour cream. I sprinkled a few green onions on top for color and crispycrunch. Mmm... hot chili with cool sour cream. To make the chili, I made up my own recipe as I went along. In a large nonstick skillet, sautee the peppers and onions in the canola oil on medium heat. When the onions are soft, add the ground turkey and continue to cook, breaking the turkey up into small chunks with a spatula or spoon. When the turkey is browned and cooked through, add the turkey, bell pepper, and onion mixture to the crock pot and stir to combine. Cook the chili on high for 3-4 hours or on low for 8 hours. Season with salt, pepper, and Tobasco to your taste. Serve the chili hot in bowls with cheese, sour cream, green onions, and corn chips (I used Garden of Eatin’ Black Bean Chips) as you wish. This was another super cheap slow cooker meal. The turkey was about $3, the bell pepper $0.60, the red onion $0.75, the tomatoes $1, the beans $1, the corn $0.50, and the spices and seasonings maybe $0.50. That brings us to $7.35 for the whole pot. Divided by five servings, that’s $1.47 per serving. Add $1 or so for sour cream, cheese, chips, and green onions, and it’s still only $2.47 per serving. Not bad! If you have lots of leftovers and are tired of eating this chili the same way every time, you could do what I did and make… nachos! To make the nachos, I just spread some baked Black Bean Chips on a foil-lined, cooking spray sprayed baking sheet and preheated my oven to 450 degrees Fahrenheit. I spooned the leftover chili on top of the chips and topped them with a handful of sharp cheddar cheese made with 2% milk. I baked the nachos in the hot oven until the cheese was melted and the chips were warm. Then I removed the nachos from the oven and happily crunched into them. Melty cheese, crunchy chips, and spicy chili belong together. On Thursday, I wanted a quick, light meal to eat before I went to work. Thursday was the first real day of my new job – last week was orientation. So I went to a local supermarket chain called Ukrop’s and started hunting for something suitable. I meandered over to their little sushi section and spotted inside-out sushi rolls with carrot, cucumber, and avocado that were made with short-grain brown rice. I usually prefer to eat brown rice over white rice because it contains nutrients that white rice does not, such as magnesium, fiber, and fatty acids. (http://en.wikipedia.org/wiki/Brown_rice#White_rice_comparison) I also really like the nutty flavor and chewy texture. I’d often wondered whether sushi could be made with brown rice, but guessed that it wouldn’t stick together the way that white sushi rice does and assumed it wouldn’t work. So, I was very surprised to see this brown rice sushi! Twelve pieces for $5.49 seemed reasonable enough, so I bought the package and brought it home. I know that supermarket sushi is probably a huge faux-pas for many foodies, but this tasted good! The brown rice was plenty sticky, and I liked its chewiness with the crunch of the vegetables and the butteriness of the avocado. The little black sesame seeds enhanced the nutty taste of the brown rice. The cool sushi calmed my first-day-of-work nerves. This was definitely a healthy tasty cheap lunch.